500 meters away from Kiveri Apartments, in the heart of village you find the Mini Market of Stavros Fotopoulos. There you will find a wide variety of well known and local products in best prices and offers! Nearby is the Lyberis Bakery with great variety of pastries and bread and the farmacy of the village. 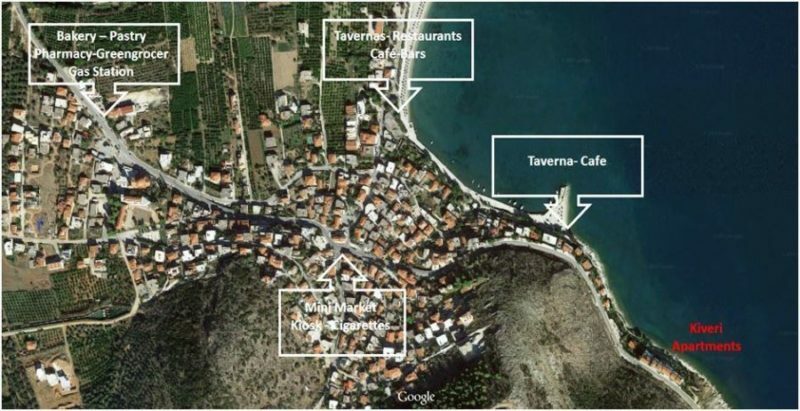 Tavernas: «To Pournari», «Katsiris», «Isalos», «Summer restaurant», «Kanaris fish tavern», «Tsioulos Grill». Kiveri is a small village in the municipal unit of Argos, Argolis, Greece. 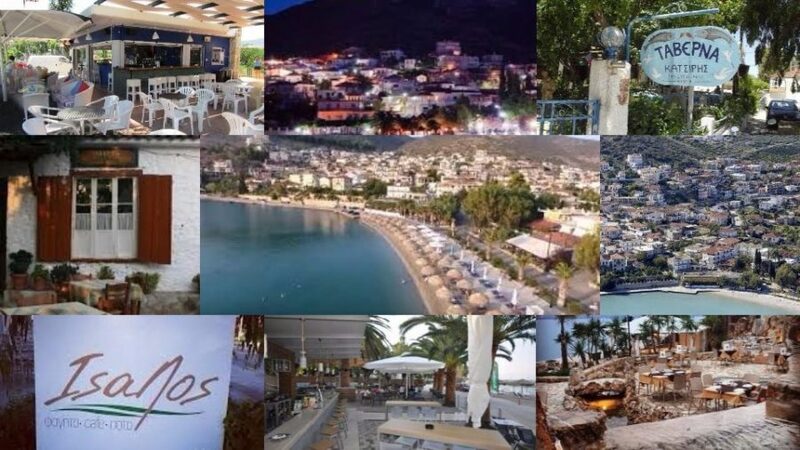 It is situated on the bay of Argos across from the tourist center of Nafplio. It has a population of approximately 1000.Kiveri is the starting point for short or long trips. It is located nearby Nafplio, Argos Mycenae and Ancient Epidaurus. Heading to Astros you will discover many secluded and beautiful beaches. Buy single ticket, with cash, also from the bus driver in the bus – please try to have the right change! Kiveri Apartments do arrange for the taxi if you wish so. Sightseeing throughout Argolis as the Mycenae, Nafplio, Argos, Epidaurus, Olympia, etc. Outside and around Kiveri Apartments, there is always space and you can park your car on the public road, safely and free of charge. Be sure to visit the town of Nea Kios on the bay near Argos at the delta of a small river where the area fishing boats are based. There is a morning fish market (08:00 am – 11:00 am) and a great seafood restaurants. If you are in the neighborhood this is a great place to come for lunch or dinner. It is right on the beach too. Nea Kios is 8 Km (12 minutes driving) away from Kiveri. Located at Karathona Beach, only 15 km away from Kiveri, NAFPLIO DIVING CENTER is a modern diving center- diving school and they offer dives for your amusement, as well as proffesional ones aiming the improvement of your level if you are begginer or certified scuba-diver. For more information please visit www.nafpliodivingcenter.gr or call at +30693234175. 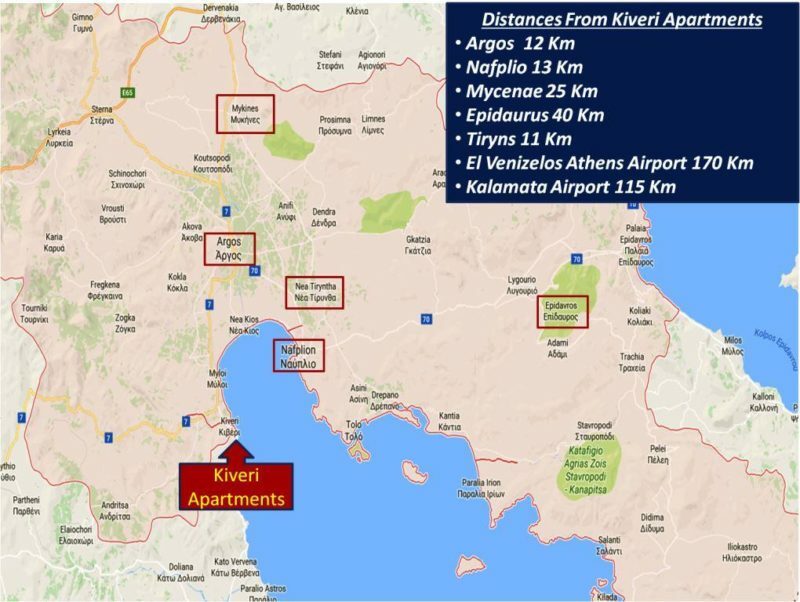 Located at Nea Kios, 9 km driving away from Kiveri Apartments. Radical Kite Center provides Kite Courses and many more. For more information please visit www.radicalkite.gr or contact them at +306972815765. PEGASUS CRUISES -based in Tolon and 30 minutes away from Kiveri – offering one-day cruises to the traditional Argosaronic Islands, Hydra, Spetses, Poros, Aegina, Agistri, Isthmus and the historic castle of Monemvasia. For scheduled cruices and prices information you can visit their webside at www.pegasus-cruises.gr/en.html and their bussiness facebook page at https://www.facebook.com/PegasusCruises. Poros island is one of the most beautiful islands in the Saronic Gulf and attracts many visitors every summer. A combination of beautiful beaches, elegant houses and pine-covered hills, is a brief description of the island. Spetses island is an island with a magical combination of crystal clear sea, lovely sandy beaches, and aromatic green pine forests. between its settlement in the 15th century and the 1821 revolution, spetses flourished, the sea traders and captains making great fortunes. Mycenae, the legendary kingdom of the Atreides, is situated upon a small hill-top on the road leading from the Argolic Gulf to the north. The site was inhabited since the Neolithic times (about 4000 BC) but reached its peak during the Late Bronze Age (1350-1200 BC), giving its name to a civilization which spread throughout the Greek world. During that period, the acropolis was surrounded by massive “cyclopean walls”, built in three stages (ca.1350, 1250 and 1225 BC), with the exception of the SE flank where a steep ravine provided natural defense. A palace was built on the summit of the hill, while towards the Argolic plain lay the wall-painted “Cult Center”, the main gate or “Lion Gate” and the “Grave Circle A”, the burial ground of the Mycenaean royalty. On the NE side, a tunnel leading to a subterranean fountain was built in “cyclopean” masonry in around 1225 BC. Outside the walls lay the residential area of Mycenae, as indicated by the number of private houses brought to light by the excavations. However the landscape here is dominated by the “Grave Circle B”, and the monumental tholos tombs, among them the ones attributed to the legendary royal family of Mycenae. The burial monuments of Mycenae also yielded the treasure of finds, now exhibited at the National Archaeological Museum and at the on site Museum of Mycenae. Located on the fertile Argolis plain of the east Peloponnese in Greece and blessed with a mild climate and natural springs, the sanctuary of Asclepius at Epidaurus was an important sacred centre in both ancient Greek and Roman times. Today, the magnificent theatre, renowned for its acoustics, is still in active use for performances in an annual traditional theatre festival. One of the most beautiful towns in the area of Argolis as well as one of the most romantic cities all over Greece, Nafplio was the first capital of the newly born Greek state between 1823 and 1834. Nafplio is located less than two hour’s drive by car from Athens, on the Peloponnese peninsula. The beautiful old city has a wealth of narrow alleyways and streets, steep stairs, taverns serving delicious Greek food, lively bars, clubs and cafés, a lovely seafront promenade, and enough sights to fill a week or two. But the best is perhaps just being in this wonderful city, watch the sun go down behind the mountains, colouring the bay red, or relax in the central square and look at the playful children, couples, friends and families enjoying food, wine or frappé – just like you. No need to read this document to understand the long history of the city. You can see it on the castles, in Akronafplia and Palamidi. The city speaks for itself about its past and for those who have passed through here, the Franks, the Venetians, the Turks, the conquerors and their benefactors. According to mythology, it is considered the most ancient city of the world. Built at the center of the fertile Argolic plain, along with Thebes, it was the most powerful city of Ancient Greece. It has significant archaeological monuments and a great Archaeological Museum. It is located 12 km northwest from Kiveri. Agamemnon, Diomedes, and other heroes from Argolís’s fertile plain figure prominently in the Iliad of Homer. The present city of Árgos lies about 4 miles (6.5 km) from the gulf below Kástro hill (ancient Lárissa), a site probably occupied since the Early Bronze Age and very prominent in Mycenaean times (c. 1300–1200 bce). A small market town on the Corinth-Návplion rail line, it is built over much of the site of the Classical city. The modern city of Argos is a prosperous agricultural town based on the sale of its local produce, especially citrus fruits, and related food-processing industries. For tourists, it is an important railway junction and notable for its ruins of an ancient temple to the goddess Hera. Findings from local excavations can be seen in the Archaeological Museum of Argos. Kefalari is situated 3 kilometres away from Argos. It is among groves, rural houses, modern villas and old traditional watermills. The picturesque church and old traditional watermills. The picturesque church of Zoodochos Pigi along with the amusement grounds around river Erasinos springs, make Kefalari an attractive place to visit. Tiryns is a major Mycenaean citadel, located in Argolis, near Mycenae, already important by the Middle Helladic period. Being 1.5km from the sea, it controlled the trade routes between the mainland and the Aegean centers. The area was inhabited before the Bronze age, and ancient Greeks believed that the citadel was built by Proitos, brother of the king of Argos, Akrisios, and grandfather of Perseus, the founder of Mycenae. Akrisios stayed in Argos, Proitos took the Heraion, and Mideia, Tiryns” (Pausanias, 166). Archaeological evidence supports Pausanias in the belief that Tiryns was fortified two generations before Mycenae (Iakovidis, 91). There is no evidence of the relationship between Tiryns and Mycenae, so the general belief is that it ranged between friendly, cooperative, and adversarial through the centuries. It is also believed that Tiryns functioned as the port of Mycenae, mainly because it never reached the fame of the latter.Earthquakes devastated the citadel by the end of the 13c BCE. but the site remained occupied for a long time after. It was active in the early Iron Age, and during Classical times when it sent a contingent of warriors to the battle of Plataia. It was destroyed by Argos around 470 BCE, and it became a stronghold during Hellenistic times, and a church was built on the citadel during the Byzantine period. The pyramidal in Hellenikon was excavated first by Wiegand, who essentially removed all the fill from the floor. Later on in 1937, more excavation was made by the American School of Archaeology at Athens under the direction of L. Lord who concluded that both the structure at Ligurio and the one at Cephalaria were “guard houses capable of accommodating a small garrison who could control the countryside and be safe behind their walls from surprise attacks by a few persons.” Amongst the findings are a large pithos, the floor of the long corridor and the room, re-carved from repairs, entrance door, and parts of the wall, infill from earlier excavations. Some ceramics of Protohelladic II period (2800–2500 BC) were attributed by S. Wienberg, a member of the team. Their location and distribution however is not described clearly. There are also room foundations and mortars from later uses of the building, as well as mixture disturbed sediments with ceramics of classical period (lamps, house ware), and some few coarse sherds of doubtful age, and some Roman lamps. The infill at the floor varies between 20–60 cm. There is considerable controversy about the dates of these structures, with conflict between dating based on archeological excavations and dating through what was at the time the new technique of thermoluminescence dating, Ioannis Liritzis and his team argue for an early date through five sub-projects: 1) geophysical prospection inside and around the two pyramidals at Hellenikon and Ligourio, where buried monuments were discovered, these results directed the archaeological excavations carried out by archaeologist A.Sampson and archaeologists of the Archaeological Museum of Nauplion. Amongst the new finds were foundations of rooms, ceramics of Classical, Hellenistic, Roman and Protochristian periods, and protohelladic II in the exterior foundations of Hellenikon above the bedrock. A comparative study of masonries was also made, astronomical orientation of the long entrance corridor was found related to the rise of Orion’s belt occurring in c. 2000-2400 BC, the dating of some parts of the overlying large megalithic blocks in the wall, with the novel thermoluminescence dating method of rock surfaces. Sampling was chosen for their firmness and lack of sun exposure of internal contact surfaces, by removing a few milligrams of powder from pieces in firm contact. Seven pieces gave an age range of c. 2000–2500 BC, while two ceramic sherds of non-diagnostic typology one from Hellenikon and one from Ligourio dated by TL and OSL gave concordant ages of 3000±250 BC and 660±200 BC respectively. This time frame would place construction of these structures at a time overlapping the construction of the pyramids in Egypt. Mary Lefkowitz has criticised this research. She suggests that some of the research was done not to determine the reliability of the dating method, as was suggested, but to back up an assumption of age and to make certain points about pyramids and Greek civilization. She notes that not only are the results not very precise, but that other structures mentioned in the research are not in fact pyramids, e.g. a tomb alleged to be the tomb of Amphion and Zethus near Thebes, a structure at Stylidha (Thessaly) which is just a long wall, etc. She also notes the possibility that the stones that were dated might have been recycled from earlier constructions. She also notes that earlier research from the 1930s, confirmed in the 1980s by Fracchia, was ignored. She argues that they undertook their research using a novel, previously untested methodology in order to confirm a predetermined theory about the age of these structures. Liritzis responded in a journal article published in 2011, stating that Lefkowitz failed to understand and misinterpreted the methodology. Sampson wrote that it was “already proved that the monument stood on Protohelladic constructions, therefore it was built in a later time. Besides, the masonry of the pyramid, similar to that of Ligourio, leads us to the Classic or Late Classic years. A new method for dating the stone, recently applied to the pyramids, indicated a too early dating in the 4th and 3rd millennium BC, which of course cannot be accepted. – a first class experience for visitors seeking education, entertainment, initiation to wine or hospitality. Domaine Skouras, regularly organize Wine Tastings and Winery Tours where you have the opportunity to visit the Winery and the Vineyards, but also relax while sipping wines in the Wine lounge bar. Nemea is arguably Greece’s most important red-wine appellation, located in the northeastern corner of the Peloponnese peninsula and 50 min driving away from Kiveri Apartments. The mountains and valleys surrounding the small village of Nemea have been producing wine for centuries, mostly from the native Agiorgitiko grape. A wide range of styles are made from this red grape variety, from rich, age-worthy dry wines to lighter, sweeter examples. Cooperative Winery of Nemea, Domaine Bairaktaris and Palivou Estate are worth visiting places.